Focaccia is popular in Italy and is usually seasoned with olive oil and salt, and sometimes herbs, and may be topped with onion, cheese and meat, or flavored with a number of vegetables. 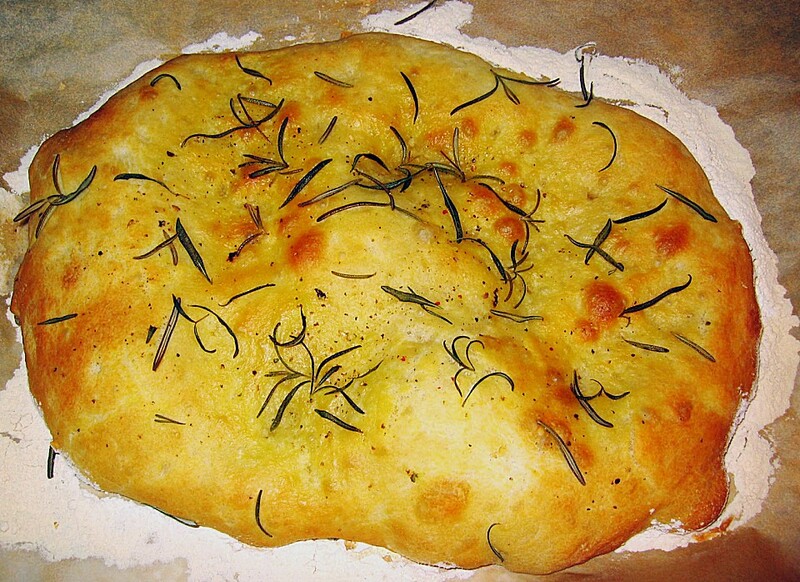 Focaccia can be used as a side to many meals, as a base for pizza, or as sandwich bread. The common-known focaccia is salt focaccia. Focaccia doughs are similar in style and texture to pizza doughs, consisting of high-gluten flour, oil, water, salt and yeast. It is typically rolled out or pressed by hand into a thick layer of dough and then baked in a stone-bottom or hearth oven. Bakers often puncture the bread with a knife to relieve bubbling on the surface of the bread. Also common is the practice of dotting the bread. This creates multiple wells in the bread by using a finger or the handle of a utensil to poke the unbaked dough. As a way to preserve moisture in the bread, olive oil is then spread over the dough, by hand or with a pastry brush prior to rising and baking. In the northern part of Italy, lard will sometimes be added to the dough, giving the focaccia a softer, slightly flakier texture. Focaccia recipes are widely available, and with the popularity of bread machines, many cookbooks now provide versions of dough recipes that do not require hand kneading.